Island Home return to service delayed; high speed service unlikely in near future. The last high-speed trip departing Vineyard Haven tonight will be at 9 pm. The last trip (MV Sankaty) departing Vineyard Haven tonight will be at 9:30 pm. The last high-speed trip departing Woods Hole tonight will be at 8:30 pm. The last trip (MV Martha’s Vineyard) departing Woods Hole tonight will be at 9:45 p.m.
Because the M/V Island Home and the M/V Woods Hole have not yet returned to service, the SSA has been unable to carry the number of vehicles expected to be able to carry when vehicle reservations were accepted earlier this year. As a result, SSA has had to change dozens of vehicle reservations to other trips today where space was still available. At this time, SSA is planning to keep the standby lines at both the Vineyard Haven and Woods Hole terminals open on Wednesday. Reservations are available for trips in both directions. Customers can check the status of their vehicle reservation, modify an existing reservation or make a new reservation by going on line, at www.SteamshipAuthority.com, or by calling our Reservation Office at 508-477-8600 from 7:30 a.m. to 4:00 p.m. The Steamship Authority intends to seek a warranty claim from Rhode Island shipyard Senesco Marine after encountering problems with the M/V Martha’s Vineyard, according to Steamship general manager Robert Davis. 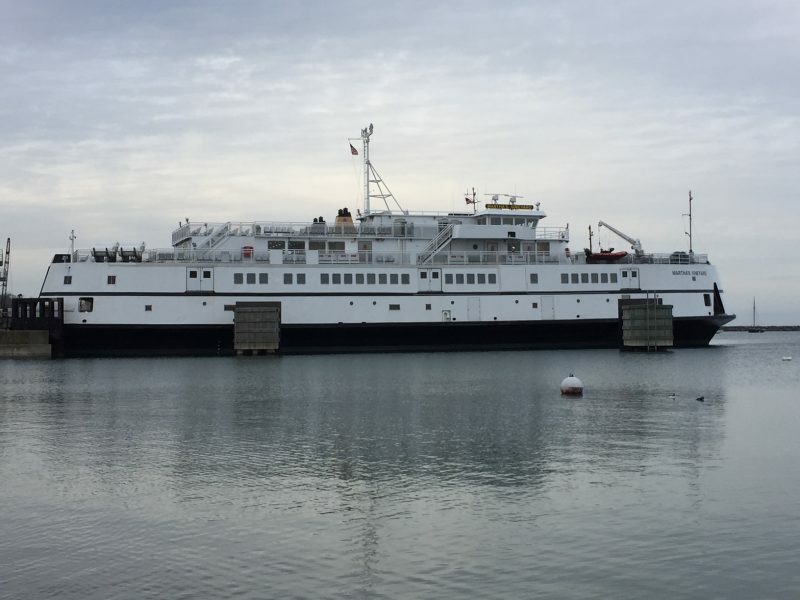 The Martha’s Vineyard returned to service March 7 after a midlife overhaul at Senesco and went on to experience mechanical issues that waylaid it off East Chop on the evening of St. Patrick’s Day. More issues have pulled it out of service several times since then. Senesco “continues to provide support” to the Steamship Authority, Davis said in a telephone interview. “There will be warranty claims [but the] focus is on restoring service,” he said. The M/V Martha’s Vineyard was briefly out of service Friday evening — for one trip, as Davis described it. A problem with its bow door was quickly rectified, he said. However, problems have continued. Monday, Davis said a breaker tripped on the bow thruster. The breaker had to be replaced in the field. Numerous calls to Michael Foster, vice president and general manager of Senesco Marine, have not been returned. An explosion occurred at Senesco’s North Kingston shipyard in January, the Providence Journal and other local news outlets have reported, a time period during which the M/V Martha’s Vineyard was being worked on there. The source of the explosion was propane, according to Michael Sweeney, of the Rhode Island Division State Fire Marshal’s office. Two people were injured, one seriously, he said. OSHA (Occupational Safety and Health Administration) Rhode Island area director Pat Griffin told The Times that a report on the accident is 80 percent complete and should be done by the end of the month. He declined to offer further detail. Davis said he’s received no indication the explosion damaged the M/V Martha’s Vineyard. Senesco also recently worked on the M/V Island Home. That vessel remains sidelined with technical problems and will not return to service until sometime between Tuesday afternoon and Wednesday morning, Davis said. Work on the vessel stalled because a technician en route from Denmark encountered a travel delay, Davis said. Davis expects the technician to be at the Steamship Authority’s Fairhaven facility at 6 am Tuesday. By noon, Davis said the work — which involves control software for the vessel’s bow thrusters — should wrap up. He anticipates a Coast Guard inspection by Tuesday afternoon. Adam Robson, a design engineer for Tees White Gill in Saltburn-by-the-Sea England, told The Times by telephone the company had two engineers aboard the M/V Island Home Tuesday morning. Robson said they were working out a software problem centered around the bow thrusters’ interface with the M/V Island Home’s new diesel engines. Robson said he was previously onsite in Rhode Island for part of the refit of that vessel. Tees White Gill also makes the bow thrusters installed in the M/V Martha’s Vineyard and the M/V Woods Hole, Davis said. The Woods Hole passed a Coast Guard inspection on Monday afternoon, Davis said. The vessel will temporarily replace the MV Sankaty and do ferry runs between Hyannis and Nantucket Tuesday and Wednesday to give technicians a reasonable window in which to evaluate its performance, he said. Continuous monitoring for a 10.5 hour schedule as opposed to 18 hours, as it would be on a Vineyard schedule, will be less taxing for the technical crew, he said. He expects it to return to Vineyard service after that, he said. Hyannis terminal manager Chris Chace told The Times Tuesday afternoon the MV Woods Hole did it’s first run at 6:30 am Tuesday morning with technicians aboard and began the next run at noon, per the MV Sankaty schedule. On Thursday “if everything goes well, it will go back to Woods Hole,” he said. The Steamship Authority won’t be able to request a warranty claim from Conrad Shipyard in Louisiana because the vessel is two years old, Davis said Tuesday morning. A one-year warranty is the industry standard, he said. Through a spokesperson, Conrad Executive Vice President Scott Theriot declined to elaborate much further on the shipyard’s position. “Conrad Shipyard stands by its previous statement and offer to assist, but requests that all updates on vessel status come from our customer the Steamship Authority,” he said. Shipyard spokesman Tim Weston previously told The Times that Conrad has a strong shipbuilding track record that dates back decades and that the M/V Woods Hole was named both ship of the year and a top-10 ship of the year by various maritime trade publications. Given the popularity of swift service from the SeaStreak, The Times asked Davis if a high-speed vessel like the M/V Iyanough or the larger CAT that runs from Maine to Canada (with vehicles aboard) could eventually make regular trips from Woods Hole to the Vineyard. While he said he respected passengers’ appreciation of the SeaStreak’s speed, he didn’t think it was in the cards due to the amount of fuel fast boats consume. He also said there are currently no slips available to accommodate such a vessel during the season.